Every organism that survives by consuming energy needs a feedback mechanism that ensures operational stability. To monitor the internal pressure – blood-pressure, steam pressure, whatever – a gauge is needed. For the market economy, the price of “land” is the most comprehensive indicator of the health of society at large. So why do governments like Britain’s refuse to publish a Land Price Index? The need for such an index is illustrated by China. She is creating a pro-market economy. Her law-makers, if they want to be efficient at serving the nation, need to simultaneously monitor trends as disparate as take-home wages (affecting consumption levels), investment in infrastructure (affecting productivity levels), government revenue (affecting social welfare funding levels) and the psychological state of the population (affecting national health levels). With the correct diagnostic tools, these levels can be “read off” from the price that people pay for using the services provided by nature and society. China is currently in trouble. Nation-wide stress levels are registered by such phenomena as unaffordable house prices, local government indebtedness and increasing numbers of civil disturbances as local communities protest against the grab of farmland for redevelopment…the list is growing. Now look at the graph. Residential land prices in the capital have been growing exponentially. China is overheating. At present, China’s government is not equipped with the best forensic techniques for stabilising the economy. The People’s Republic needs fiscal instruments that would “cool” the land market and relieve all the pressure points. 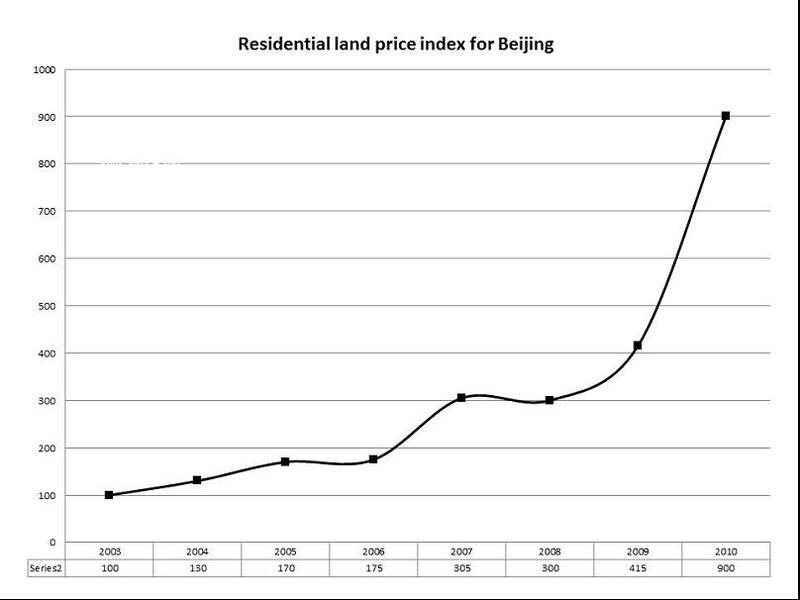 The Beijing government is commissioning pilot studies into the various property tax options. But the tide of history is running against it: the temptation to privatise the socially-created stream of revenue (rents) is rapidly building up. Rent-seeking waits for no-one. One result: bad policy decisions. A current example is the decision by the National Development and Reform Commission (NDRC) to endorse the roll-over of debts accumulated by local governments. Local governments have largely relied on leasing out land to fund the provision of infrastructure. Over the past three years, this mechanism has driven their debts to almost $3tn. The so-called “shadow banks” have cash-in, capturing some of the rents. The debt-driven culture – one of the reasons for the collapse of the trans-Atlantic economies in 2008 – is being embedded in China. If it is allowed to flourish, that culture will become the institutionalised mechanism for manufacturing poverty. The political danger created by the NDRC decision is that, by rolling over debts incurred in land development operations, politicians will continue to privatise the socially-created rents, making up for their shortfalls in revenue by borrowing from banks. The costs of servicing the debts are then transferred to future generations. This is the formula for creating irresponsible governance, reckless economic administration and the onset of a statecraft based on greed…the model of politics and economics that blights the Western democracies. Registering the price of land in an index is not sufficient, however. Japan has the world’s best data-base on land values, and her governments routinely refer to the price of land. And yet, economic policies employed by her governments locked Japan into a two-decade depression. The British government recently decided to abolish the land price data that used to be published by its Valuation Office. But having the information, by itself, does not automatically make for good governance (as we see in the case of Japan). What matters is a correct understanding of what the information on rents reveals about the general health of the economy. Ask these questions: what are governments afraid of? What are they trying to hide?